Let’s get a little more in to the snow discussion. Specifically, how much and for who. I’ve put together a matrix of cities and various computer models’ snow output. 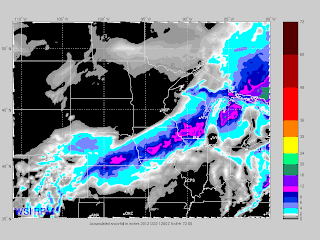 To begin with, here is the 12z snow accumulation projection from the high resolution RPM forecast model. The model run covers snow through 6am CT Saturday. Heaviest snows will fall from southern Nebraska, central Iowa, southern Wisconsin and northern Michigan. Now to the matrix. These are for various locations across the Midwest. I will continue to update the matrix as more model data comes in. This way, you can see what the various models are indicating.